Home / news / A MOTHERS STORY: EMILY ZAWE – UNBREAKABLE SPIRIT! Today we have the privilege of sharing a story from a mothers heart. Her trials, her triumphs, her strengths and her challenges. We met Tamara Zawe a few months ago through our Information and Communication programme and what was most memorable about the conversation is that our programme officer ended up feeling more inspired after having spoken to Zamara! We trust that as we have just finished celebrating mothers day this past week, that you would be inspired as this story touches on various challenges and thoughts that countless mothers encounter in our country when standing in the gap for their children with diverse needs. 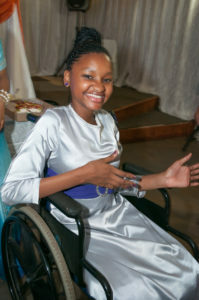 Emily Zawe is a young lady aged 15 years old born in Zimbabwe on the 30th of January 2003, diagnosed at about eighteen months with the type 2 Osteogenisis Imperfecta (brittle bones disease), after having approximately eleven or more femur fractures on either side from as young as two weeks old. TO DATE EMILY HAS HAD 50 FRACTURES IN TOTAL AND 10 SURGERIES. With the support of family and friends who know and understand our situation we try to fundraise and pay the hospital because the number of time she is in and out hospital exceeds the number of hospital bills we get. What a lot of people don’t understand is that medical care for children is free until the age of 7 years old. We have been classified at Steve Biko Hospital because we are both working parents and are required to pay the hospital. A lot of people declare they are unemployed and people assume that a government hospital is free, which is not true. Due to the nature of her condition we also need a lot of time off from work so lying could never work for us as we need a doctors letter. When she was 3 years old we accepted the severity of her condition and relocated to South Africa for a better chance at life for our daughter, who is South African through her father, to have access to available medical treatment and facilities. Emily is special in the sense that her bones are very fragile, and require constant extra-ordinary care, but in every other way as normal as any other child. We have to come to the conclusion that her body is “CRAZY” and her mind her “NORMAL”… but there are no schools for people like her here. Emily has a long history with Steve Biko Hospital as we have been receiving treatment there from 2007. Majority of our life is spent with her in the hospital, the longest stay she had was from November 2010 until end of February 2011. During that time she even attempted to attend a Special School but they came back to us and said she does not belong there. The hardest challenge is that she is growing like any normal person she wants to walk and be free of her wheelchair. She pushes boundaries and the pressures of High School makes it harder for her to accept who she is. But through God’s grace, she attended a mainstream crèche, mainstream ordinary primary and high school. As her, mother I believe she is setting the pace though it is rare to have more children like her attending mainstream schools. I am against the separation because we must teach our children what segregation and discrimination is. It’s only her second year but with the challenges we have Emily is seeing a school psychologist for support because she often feels like she does not belong… which is sad. For every school, she attended it may not be a big change but in the schools, ramps were put up, the educators were informed of her condition and learnt how to support her. Changing of classes stopped in order to accommodate her because we had to carry her up 20 – 40 flights of stairs. On some days she was forced to walk (because she can but is always safest in her wheelchair) to get from one class to the next. The toilets were the biggest challenge because they not built to accommodate a wheelchair. Most importantly for most normal ordinary children for the first time, those children realized that there are different kinds of people. Some felt threatened by her “special situation” and others embraced her to try to understand what she is going through. In a small way, we have taken a tiny step to teach those kids and educators that with a mother like me integration can be possible. So between dealing with the hospital and the school, her life is a challenge. We thank God for all the people around us who have supported us this far. I am a strong believer in the “Ask and you shall receive life rule” and that is what has brought us this far. I am well known at the Department of Education for making a whole lot of noise for Emily and at Steve Biko Hospital for appealing to them to understand our position. What scares us a little is that we are average middle class parents leaving within our means to give a simple and the most normal life possible. Emily is 15 and we worry for the future of daughter when she was younger it was cute but now she is growing and it is really getting heavy and serious. Hence I am against segration because there is not special treatment in the “real, normal, bad world”. She misses a lot of school and is an average student and sometimes it is hard to support her financially to get tutors to fill in the gaps for her. But we make the most of each day and we just push her the best way we know how. At this point, I am already researching on options for her to get a computer certificate during the next school holidays and options for University being wheelchair bound. It is sad that we don’t fix the integration issues now but when she finishes school she is expected to just fit into the normal working environment. Emily loves to write. She so dreams of having a writing club in the High School she attends but that requires financial resources and support. The school which I am now sitting as the SGB Chairperson as of the 1st of April 2018, in which I hope to bring some of the changes to get more children like in there and fully support her for the next 3 years of matric is another load I have taken upon myself to bring the change we would like to see. We have had a journey and she has a story to tell. She inspires me to be better and to do things I never thought I possibly could. For us financial assistance to help pay off the hospital and to one day pay for the correctional surgery of her weak left leg. Support structures for other rare conditions which need to be recognized. Amazingly overseas there are so many platforms for brittle one disease but here it’s rare to find kids like Emily. So hence I stand up and speak out for Emily.